Figure illustrating the gene flow. Two homozygous populations the first with dominant alleles and the second with recessive alleles are separated geographically. 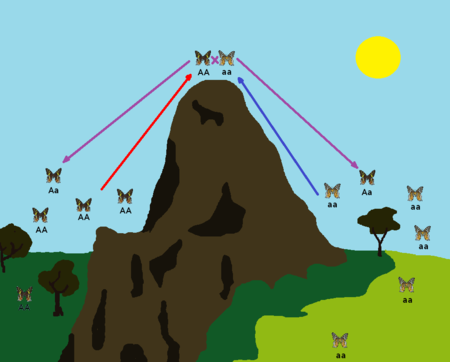 Some butterflies of a population migrate and come into contact with another population of butterflies, butterflies producing heterozygous so incorporating their alleles in the other population. In population genetics, gene flow or gene migration is the transfer of alleles or genes from one population to another. In other definition, is the propagation of genes from one breeding population to another by migration, possibly leading to changes in allele frequency. The overall effect of gene flow is that it hinders the genetic divergence between populations and increases the genetic variation within populations. When gene flow between populations is reduced or absent, the two populations may go to diverge to the point that members of a population can not be able to interbreed successfully with members of the other. Gene flow between biological species can be largely or entirely prevented by isolating mechanisms or barriers to gene flow. These barriers are most of the time physical like impassable mountain ranges, canyons, oceans or other large bodies of water, extensive deserts and so on. ↑ Snustad, Peter; Simmons, Michael J (2012). Principles of Genetics (6th ed.). River Street, Hoboken, NJ: John Wiley & Sons, Inc. p. 728. ISBN 978-0-470-90359-9. ↑ Pierce, Benjamin (2003). Genetics: A Conceptual Approach. W. H. Freeman. p. 681. ISBN 978-1-57259160-8. ↑ Klug, William S.; Cummings, Michael R.; Spencer, Charlotte A.; Palladino, Michael A (2012). Concepts of Genetics (10th ed.). Boston: Pearson. p. 713. ISBN 978-0-321-72412-0. ↑ Futuyma, Douglas J. (2005). Evolution. Sunderland, Massachusetts: Sinauer Associates, Inc. p. 359. ISBN 978-0-87893-187-3. This page was last modified on 28 July 2013, at 10:10.